NEW ORLEANS – Ecumenical Patriarch Bartholomew of Constantinople opened a symposium on the environmental challenges in the Mississippi River region Oct. 21 by reasserting the role people of faith play in caring for the earth’s resources. Dubbed the “green patriarch,” the spiritual leader of the world’s 300 million Greek Orthodox has sponsored an annual symposium on the environment for the last eight years in different parts of the world. His interest in holding this year’s gathering in New Orleans was sparked in part by the damage inflicted on the city by Hurricane Katrina in 2005. 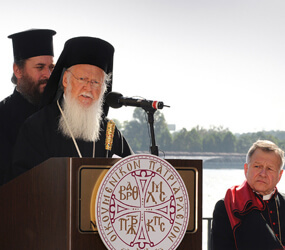 “As we look at this great river and explore the challenges faced by local communities, let us search for solutions from the perspective of faith, mindful that we are all in the same fragile boat of life,” Patriarch Bartholomew said, his black robes fluttering against the wind as he spoke from a podium set up at a hotel on the banks of the Mississippi. “We are living defining moments in history, and we are living them together in truth, in love, in hope and, above all, in responsibility,” he said. The patriarch, who visited New Orleans just a few weeks after Hurricane Katrina inundated 80 percent of the city, was welcomed to New Orleans by Archbishop Gregory M. Aymond, who read an official greeting from Pope Benedict XVI. “My thoughts and prayers are with all those, especially the poor, who experienced suffering, loss and displacement, and all those engaged in the patient work of rebuilding and renewal,” the pope said in his remarks. Patriarch Bartholomew said the eighth annual symposium, titled “The Great Mississippi River: Restoring Balance,” was historic and unique. Author John Barry, who wrote the acclaimed “Rising Tide: The Great Mississippi Flood of 1927 and How It Changed America,” also addressed the symposium. He said the flooding in New Orleans was a foretaste of what could happen to other coastal communities given rising sea levels around the globe. Barry said how south Louisiana handles its problem of disappearing coastal wetlands will be either a positive or negative model. In the days before levees were constructed along the Mississippi River to protect populated areas, the river regularly deposited sediment to build up land in the delta. However, 40,000 dams have been constructed over the last several decades, and that has drastically reduced the level of sediment available to build up coastal marshes. “New Orleans is not naturally vulnerable to hurricanes, but it has lost 2,300 square miles of land – bigger than the state of Delaware,” Barry said. Six of the largest electricity-producing dams, located in Montana, North Dakota and South Dakota, have trapped half of all the sediment carried by the river, Barry said. “The river once built 34,000 square miles of land in seven states in the flood plain,” Barry said. “The Mississippi River, like all rivers, is an integrated system. We now have 30 to 40 percent of the sediment that used to be in the Mississippi River. The loss of that sediment has had a significant impact on the erosion of coastal lands. “There is enough sediment in the river basically to hold what we’ve got and fill in the gaps. 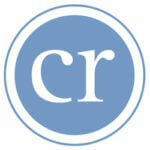 That absolutely has to be done to protect south Louisiana,” he said. It all comes down to money, Barry said.